The Oregon Forest Practices Act governs forestry work on non-federal lands. The person responsible for the forestry work must notify the Oregon Department of Forestry at least 15 days before the start of the operation. To notify the agency the person submits a Notification of Operation through the Forest Activity Electronic Reporting and Notification System (FERNS). FERNS will also allow you to apply for a Permit to use Fire or Power-Driven Machinery (PDM), which you must obtain for any operation that uses fire or power driven machinery. 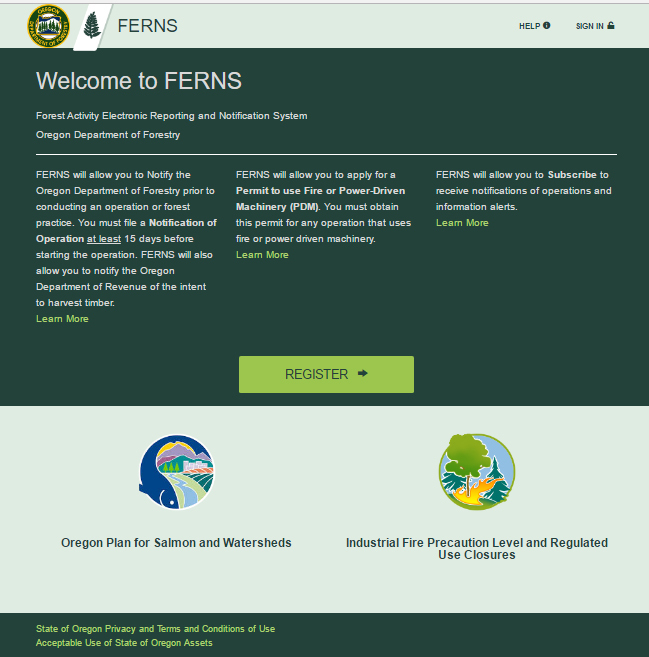 Additionally, FERNS now has a subscription service for users wanting to receive information and updates about plans for forestry work or to submit official comments about the plans.